In honor and in memory of PATTI PAGE, Baltimore Net Radio will be playing four songs an hour all day on Friday, January 4th for 24 hours to a world wide audience. Three times during the day @ 10am, 3pm and 8pm (all New York times) a rebroadcast of BNR's Birthday Tribute to Patti which aired on her last birthday, November 8, 2012 will be played. As an added bonus, Baltimore Net Radio will air the last live interview Patti did for her 2011 Birthday at select times during the day. Go to: www.baltimorenetradio.com - click on the LISTEN LIVE button and enjoy! Baltimore Net Radio will pay tribute by celebrating the 85th birthday of Patti Page, the glorious voice of post-war America, and one of America's true musical icons. All day Thursday, November 8th, is PATTI PAGE DAY, as Baltimore Net Radio celebrates the "Singing Rage" in honor of her birthday! Amidst their regularly scheduled programming, Baltimore Net Radio will play an average of 4 Patti Page songs each hour beginning at 12:01 AM NYT. Baltimore Net Radio will pay tribute by celebrating the birthday of Patti Page, the glorious voice of post-war America, and one of America's true musical icons. Tune in on Tuesday, November 8, 2011at 3pm NYT for a 3-hour streaming tribute honoring America's living legend, whose recording career spans seven decades. This celebration will stream from http://www.baltimorenetradio.com and listeners will enjoy Page's music along with words from her family, friends, and fans. This tribute program will feature Page's recordings from her first hit single (by famed songwriting team "Bennie" Benjamin and George David Weiss) "Confess," in 1948, to her last recorded material in 2008. Listener's will revel in the hits such as Tennessee Waltz, Mockin' Bird Hill, and Old Cape Cod, as well as many, many others within the traditional pop and country genres. If you would like to extend a personal greeting to Patti Page for her birthday, call the station to leave your message; within the USA, call toll-free 877-577-2630 option 6; International callers may call 540-288-4001, option 6. You may also e-mail patti@baltimorenetradio.com and we will read your greeting during the broadcast. It is with great sadness that we announce the passing of Patti’s loving husband Jerome “Jerry” Filiciotto. Jerry and Patti became friends in 1973, and they were married in 1990. He was her best friend and traveling companion, and he helped her greatly in her career. Together they operated the maple syrup business at Hilltop Farm in New Hampshire. “The Farm” was Jerry’s favorite place to spend time with his family. Patti feels blessed with the many who have shared their expressions of condolence. “We’re thrilled with the response we’ve had from the public as we are still in our infancy and it appears that our voting numbers will grow as our young organization becomes more widely known,” said co-founders Rook and Bateman. In January of each year voting begins for a new group of nominees. In 2008 the focus will be on three decades beginning in 1950. Each nominee is required to have at least two Top 10 hits, singles or album of any genre. Others inducted in 2007 include: Paul Anka, The Beatles, Tony Bennett, Pat Boone, Beach Boys, Teresa Brewer, Johnny Cash, Ray Charles, Chubby Checker, Jimmy Clanton, Nat "King" Cole, Perry Como, Bing Crosby, Bobby Darin, Neil Diamond, Fats Domino, Four Seasons, Aretha Franklin, Connie Francis, Brenda Lee, Johnny Mathis, Ricky Nelson, Roy Orbison, Elvis Presley, Diana Ross & the Supremes; Neil Sedaka, and Frank Sinatra. For more information, please visit www.hitparadehalloffame.org. In 2007, Oklahoma will celebrate its 100th anniversary of statehood. “Oklahoma Rising,” a two-disc CD set, has been released by the Oklahoma Centennial Commission to commemorate this milestone. A native of Oklahoma, Patti is featured on this collection along with 43 of the state’s celebrated recording artists and groups, including Vince Gill, Jimmy Webb, Garth Brooks, Reba McEntire, Brooks & Dunn and Toby Keith. Net proceeds from this limited edition will benefit Habitat for Humanity in Oklahoma. KSAV.org brings radio programming to your computer via the internet, with discussions, interviews and shows the way radio used to be. Hear Patti being interviewed by Susan McCray in her featured show, "Getting To Know You" on the Share-A-Vision Radio Network. Patti will join fellow Oklahomans as she rides on the Oklahoma Centennial Commission’s float in the Tournament of Roses Parade on January 1, 2007. Check your local television listings for broadcast times in your area. Patti talks to GRAND Magazine in the December/January issue about how raising two of her young granddaughters helps her and her husband Jerry stay young. "Those young ones have kept us young at heart," says Patti. "We look at each other and say, 'What would we do without these two little girls?' Some of the things we missed raising our own children we appreciate more now. It’s fun running after them." Between the couple, they have 13 grandchildren and often host a grandparents summer retreat at their farm in New Hampshire. Activities include games, putting on plays and giving each child "Grandchild of the Day" status that affords special privileges, such as selecting a movie or what to eat. GRAND, a magazine that celebrates the vital role and lifestyle of today's young, active grandparents is available at Barnes & Noble, Borders and newsstands nationwide. 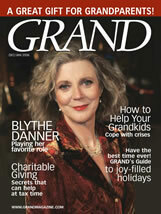 For more information, www.grandmagazine.com. On Sunday, October 23rd, Patti Page concluded her successful run in Branson, Missouri where she spent six weeks as the featured performer in "The Branson Follies," a show for the ageless that recalls the golden years of vaudeville and variety shows. Since her Follies debut on September 12, Patti performed one to two shows daily; five days a week, and wowed packed crowds at each concert. "I loved every minute of it…it was just fabulous," says Patti. "It was a perfect location and a great show. The crew and organization were so wonderful." Coming up in December, Patti will make a special appearance with the Emmanuel Faith Choir & Orchestra in Escondido, CA and return to Whiskey Pete's Hotel & Casino in Primm, NV, where she performed to a sell out crowd in January 2005. For more details about upcoming performances, click on Appearances. On Saturday, June 4, the incomparable Patti Page was at Petco Park to cheer on her hometown team, the San Diego Padres. The world-renowned entertainer performed the National Anthem for the sold-out crowd who gathered to watch the Padres take on the Chicago Cubs. Sadly for Patti, the Padres were defeated by the Cubs, 11-5. Prior to the game, Patti took part in the "Dog Days of Summer" event at Petco Park. The annual affair allows approximately 250 fans to bring their dog to the ballpark for a doggie parade and then sit with their dogs in a special section during the game. Fittingly, Patti sang one of her signature hits, "(How Much Is) That Doggie In the Window" during the parade. Patti Page has a new CD collection titled, For Sentimental Reasons that will be released nationally by DRG Records on Tuesday, May 10. The CD features 20 of her timeless live television performances from the 1950's, painstakingly restored and remastered from the original master tapes. This very special collection includes Patti's signature classic, "Tennessee Waltz," together with novelties like "(How Much Is) That Doggie in the Window" and a wonderful selection of standards such as "Route 66," "It Had To Be You" and many more. "I'm thrilled that DRG is releasing this album," says Patti. "I hope we are as successful as we were with the first album we did together, Live At Carnegie Hall. That won us both a GRAMMY, my first and only, I might add." For Sentimental Reasons will be available in retail stores nationally on Tuesday, May 10. The CD will also be available soon at www.pattipageproducts.com. For complete track listing, see below. On November 6, Patti was presented the Puccini Foundation Baccarat Award in recognition of her incredible achievements in the arts. The ceremony took place at the Lincoln Center in New York. Patti is tentatively scheduled to return to Vegas on January 15 for a performance at Whiskey Pete's Casino, where she has performed many times during hercareer. Ben Vereen, Sheena Easton, Tempest Storm and Showgirl. Patti was recently honored for her many years of support of the Interfaith Community Services and the North County Times Charities. These non-profit organizations provide a wide variety of programs for people who are poor or homeless near Patti's home in San Diego, CA. During the organization's 25th Anniversary Gala, county music singer, Lila McCann serenaded the legendary honoree with a rendition of Patti's classic ballad, "Tennessee Waltz." CMA Close-Up features Patti Page in the April/May issue of their industry trade publication. The piece is a reflection of her 55+ year career, including her latest recordings and her unique food products. Click here to read entire story. Visit www.favefoods.com to read an exclusive interview with Patti and try her Maple Sugar Bread Pudding recipe. 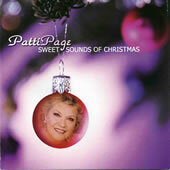 CELEBRATE THE HOLIDAYS WITH PATTI'S "SWEET SOUNDS OF CHRISTMAS"
In 2003, DRG Records released Patti Page's "Sweet Sounds Of Christmas" to retail stores nationwide. This collection of Christmas standards is a must have for the holiday season. You can also purchase the CD from www.pattipageproducts.com or by calling, 800-977-9787. Click here to listen to selected tracks from "Sweet Sounds Of Christmas." 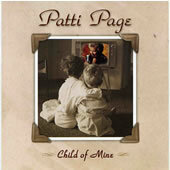 In 2003, Patti released a very special children's album titled, "Child Of Mine." Produced by her good friend and Grammy-winning songwriter/producer, Jon Vezner, the album includes a newly recorded version of her timeless classic, "(How Much Is) That Doggie In The Window.